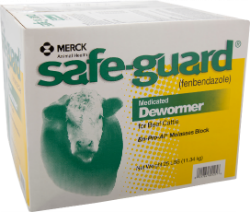 Designed for deworming pastured cattle by feeding these medicated blocks for three days only as the sole source of salt. For the removal and control of: Lungworms, Stomach worms, Brown stomach worm, Intestinal worms, Hookworm, Thread-necked intestinal worm, Small intestinal worms, Bankrupt worm, and Nodular worms. One block treats 8,000 lb. (500 lb. of cattle per 1.5 lb.). Beat the Price Increase in April! Feed block for 3 days as the only source of salt.